This is 300 H&H Mag. Federal Vital-Shok 180gr. Nosler Partition Ammo. Designed for maximum effectiveness on bigger animals with thick skin, heavy muscle tissue adn bone such as elk, moose, and brown bear. It's nickel-plated for corrosion resistance and a sleek look. You spend all year dreaming of the moment of truth - why trust it to anything less than the best. 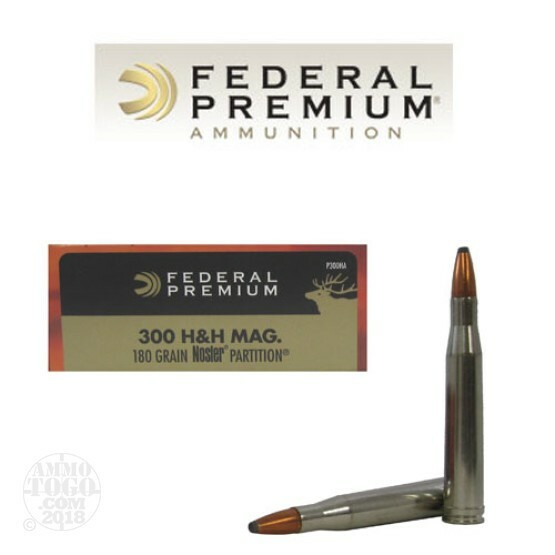 This ammo is nickel coated brass cased, boxer primed, non-corrosive and non-magnetic. It comes packed in 20rd. boxes. Velocity 2880 FPS.